The first twin tandem rotor machine to fly was built by Nicolas Florine in Belgium. First flown in April 1933, it soon attained an altitude of 6m and an endurance of 8 minutes. Although the rotors did not counter-rotate, they were tilted slightly in opposite directions to counter torque. 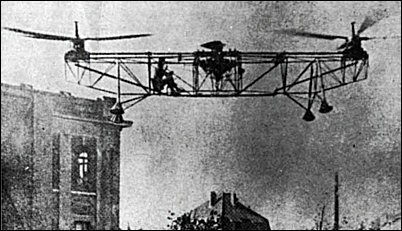 One interesting development effort of the early 1930s was a series of tandem-rotor helicopters built by Russian-born engineer Nicolas Florine in Belgium, one of which hovered at altitude for ten minutes.